Abigail has learned to live as a child of separated parents, so when her father and mother express a wish to live together again it is just too much for the 14-year-old girl. Then, a children's ghost game, 'Beatie Bow', and a piece of 19th-century lace which Abigail is wearing combine to bring her from late 20th-century Sydney back to New South Wales in 1873 and into the family of Beatie Bow. Abigail finds herself deeply involved with the Bow family, for whom she appears to have some prophetic significance. The sights, sounds and appalling stench of The Rocks area of Sydney are evoked with vividness. The streets are mean and narrow; sanitation and anything near adequate housing are non-existent for many, but it is against this background that Abigail finds herself learning a great deal about human nature. When she eventually returns to her own time, older and more mature, these lessons stand her in good stead as she begins to cope with her separated parents' wish to live together again. 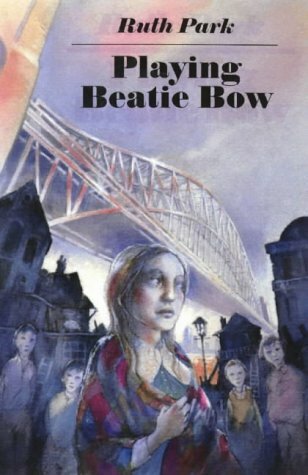 Since Playing Beatie Bow was first published in 1980 The Rocks has been redeveloped as a tourist attraction and it is possible to go on a 'Beatie Bow' trail. This is an engrossing read, and it is good to see it back in print again, but it deserves a more attractive cover.